On Sunday I had the pleasure of helping with a soup-off in the home of Gourmet Gastronomer blogger Danny Gabriner. Several people, (including me), submitted recipes, which were voted on by Gourmet Gastronomer readers. The top 4 were prepared and served at an awesome daytime party at Danny’s house. I showed up early to help and was put in charge of a very nontraditional version of Tom Kha, a luscious chicken-coconut soup. The recipe’s creator, Michael, called for a flavorful and creamy coconut broth and a variety of garnishes including shredded chicken, fried plantains, minted peas, and caramelized fennel. 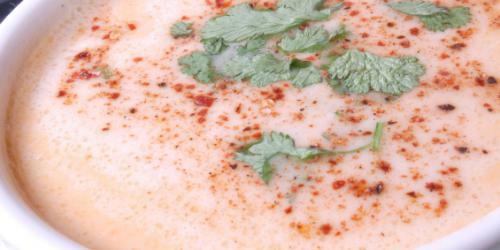 While it was absolutely delicious, it provoked in me a craving for traditional Tom Kha Gai. As I tipsily walked home from Danny’s (3 glasses of wine on an unusually sunny day will have that effect…), it occurred to me that Tom Kha Gai is totally BrokeAss. Score. Heat the oil in a large soup pot over medium heat. Add the lemongrass and garlic and cook 1-2 minutes, stirring frequently. Add the carrots, bell pepper, mushrooms, and ginger and cook for 3-4 minutes until very fragrant. Add the stock plus 1 can of water and stir well. Allow to simmer uncovered for 20 minutes. Stir in the coconut milk and salt to taste. Add the chicken/tofu and allow to cook for another 5 minutes. To serve, ladle into bowls and garnish with mint, cilantro and a squeeze of lime. I’m thrilled to hear that you and your friends have “offs”! I have a group of friends who have one about twice a year. We have had a soup-off, dip-Offs, dance-offs, and the most poular have been the pie-offs. These evenings are full of very interesting submissions. We all vote and the host awards prizes. What a great reason to get together with friends and have some great food and drinks! I made this recipe with a few changes: no mint, added 3 chopped green onions, and upped the broth to coconut milk ratio (i.e., more broth). It was super yummy and I got two dinners and two lunches out of it. YUM and CHEAP!